BRAND NEW TOP TO BOTTOM! 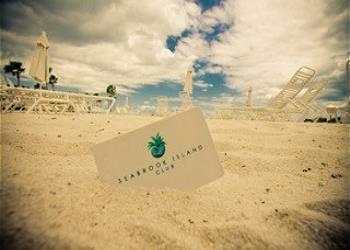 Yes amenity cards are included. 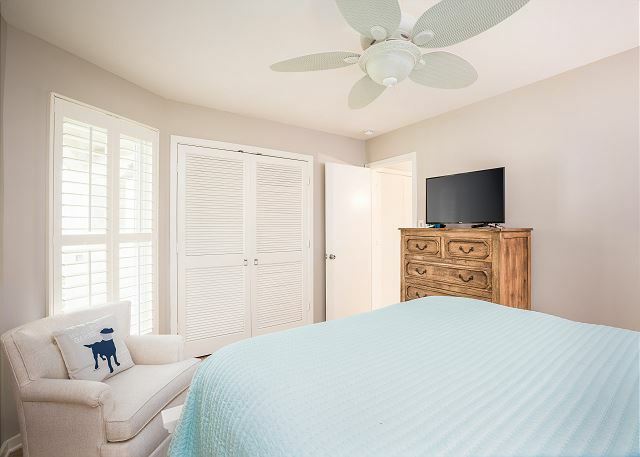 You cannot find a nicer two bedroom cottage for your vacation! 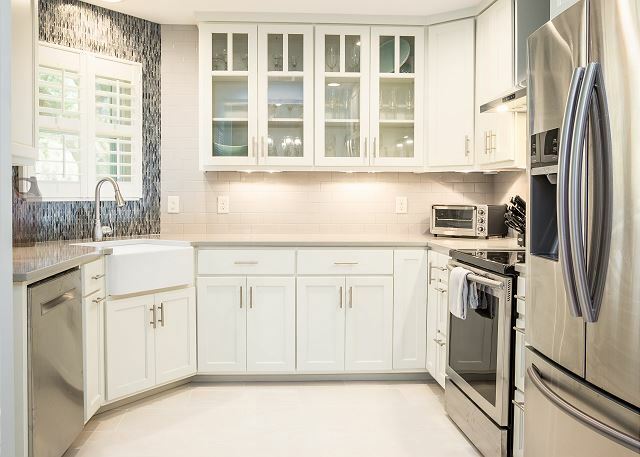 New owners are just completing a comprehensive renovation of this adorable 2 bedroom cottage! Be one of the first to enjoy this summer! 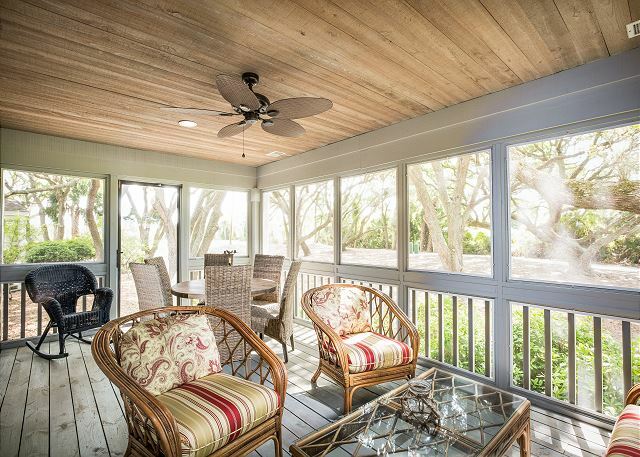 You want a SCREENED PORCH? This cottage has the best! 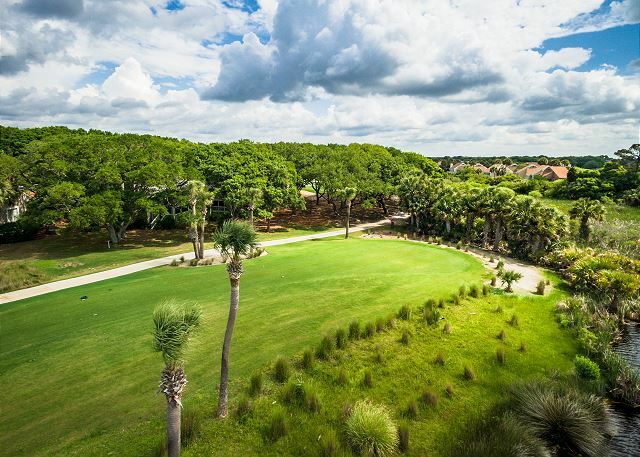 Its spacious and nestled in the Live Oak trees with views of the 17th and 18th holes on Ocean Winds golf course. 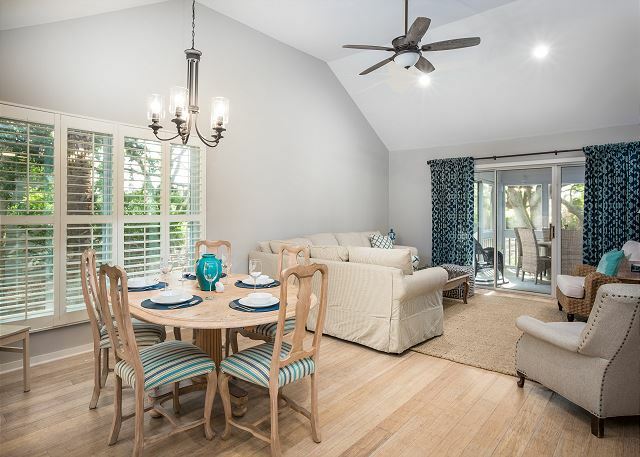 Appointed with a nice table and chairs, grill your favorite meals and enjoy a cold beverage after a day at the beach! 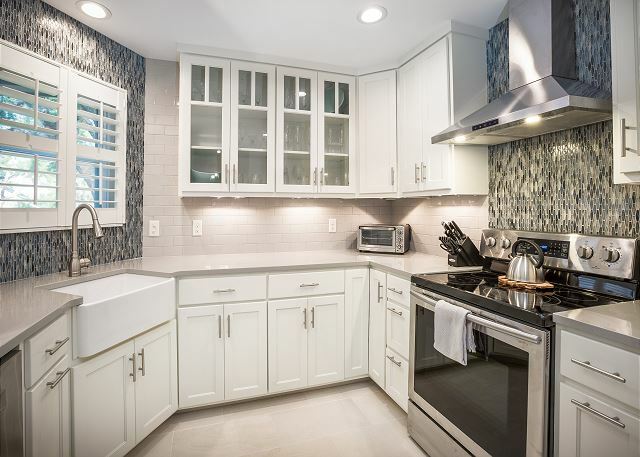 The professional renovations of the kitchen and two baths include high quality glass tile accents and fixtures. 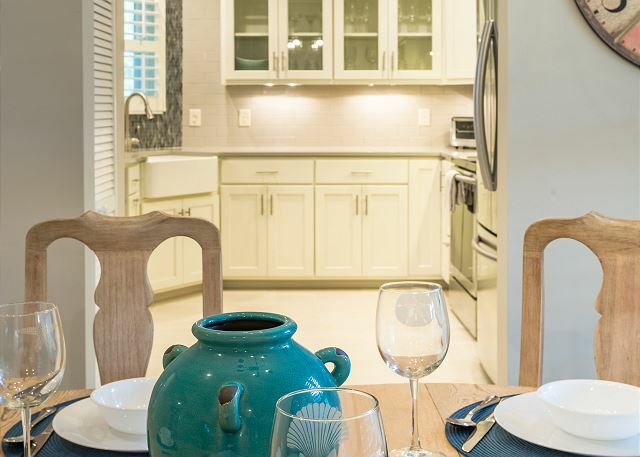 The kitchen features high end appliances, custom cabinets and lots of decorative accents. 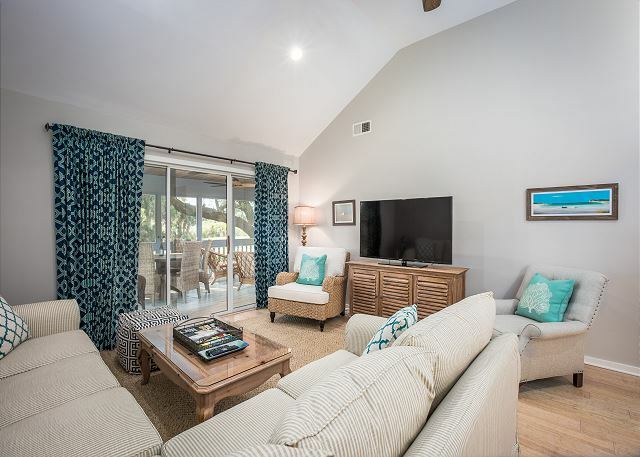 Exotic bamboo flooring was installed through out the cottage accented by Seagrass rugs. The furnishings are all brand new, very stylish and most importantly comfortable!!! The living room sectional is also a sleeper sofa! 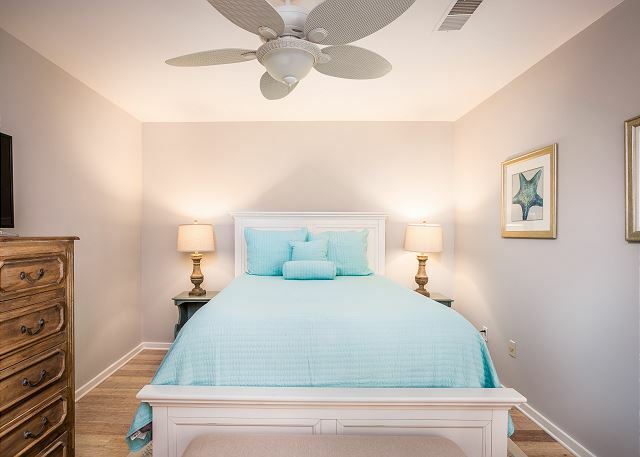 The master bedroom features new king bedding, ceiling fan and flat screen TV. 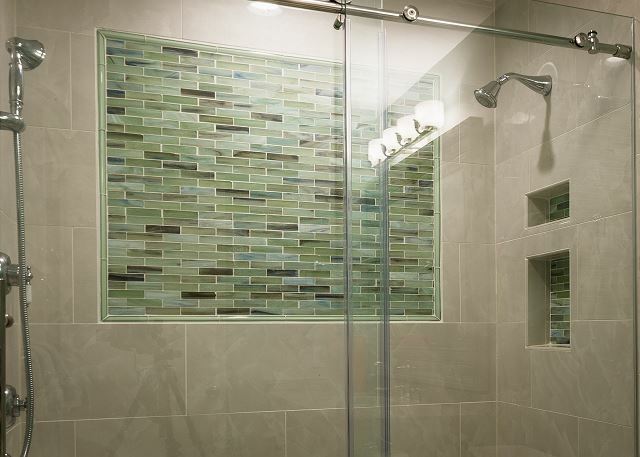 Your en suite bath offers a large custom tile shower accented by decorative glass tiles. 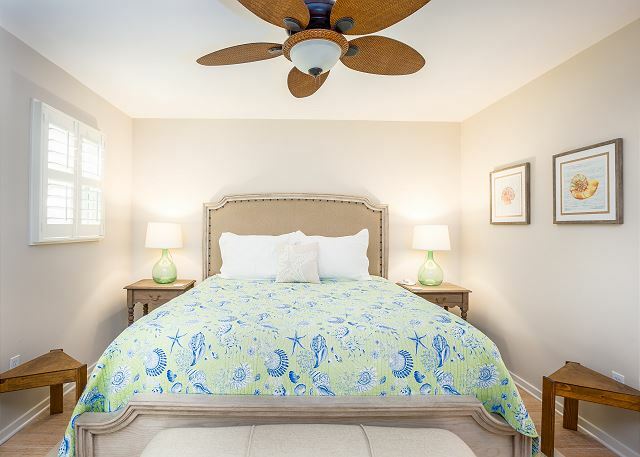 The second bedroom with brand new queen bedding is perfect as a second adult suite or great for young ones! There is also a new flat screen TV and ceiling fan here. 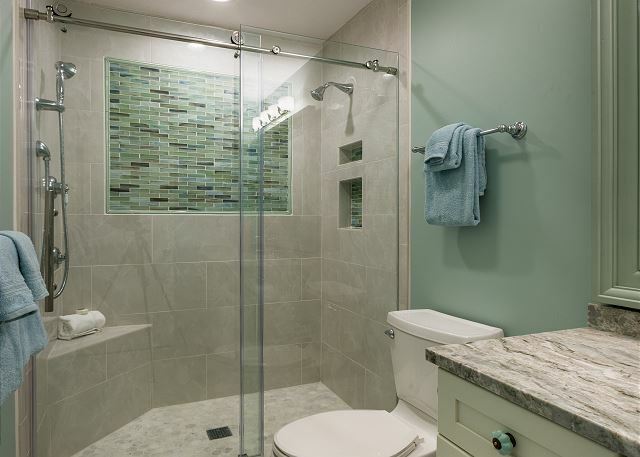 The full bath is brand new with large custom tile shower featuring additional glass tile work. 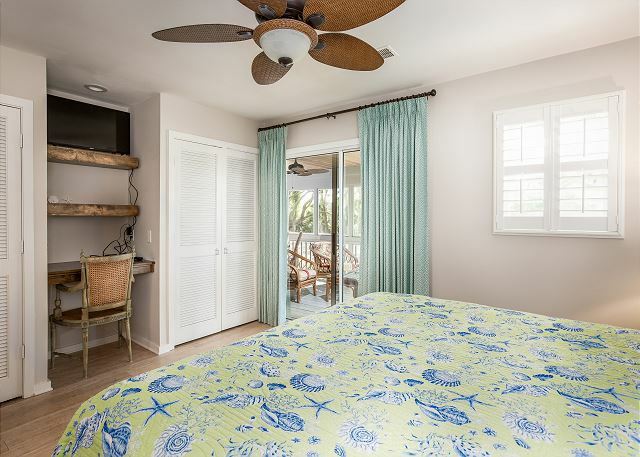 This property is for the discriminating traveler who seeks luxury and comfort on vacation! WIFI internet and AMENITY cards are included! Bike to the beach and pools. One dog considered. Call for details. HURRY for best availability! Well-stocked villa with screened porch. Beautiful views. Convenient to the beach and Pelican Club. Fantastic brunch at the Island Club. Perfect location, great weather, and a wonderful week with family and friends. Second year renting this unit -- wonderful to see deer in the mornings and nature all day. We LOVED this cottage! It was very clean and had been recently renovated to give it a modern feel. The kitchen had everything we needed. 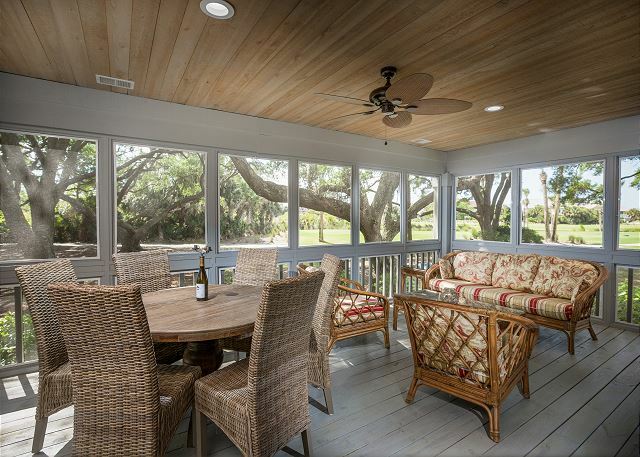 Our favorite feature was the screened-in back deck. We had all of our meals there when we ate at home. There was always a nice breeze blowing so it never seemed like 95 degrees when you sat outside. Loved having my morning coffee and watching the deer 20 feet away. It overlooks the 17th green of one of the golf courses but we never felt our privacy was infringed upon. This property is situated on a quiet cul-de-sac where we met other pet owners out walking their dogs. We never tracked the exact distance to the beach access but I would recommend bringing or renting bicycles. You can easily bike to the Pelican Beach access and the beach clubhouse pool. We also biked to the North Beach access which was a little farther but easy enough. There are a few parking spaces near the beach accesses if you want to drive. We did this on the days that we toted the beach umbrella, chairs, and boogie boards. There weren’t a large number of parking spaces by the beach access, but somehow we always managed to find one. One night we ate at The Pelican’s Nest which is an outdoor restaurant by the pool overlooking the ocean. They are a cashless facility so payment is done through the amenity cards you can obtain prior to going. The price for dinner was pretty reasonable and the food outstanding but the scenery is the true star. They also serve lunch which is convenient if you’re having a day at the pool. We had one snag and I only mention it to compliment the staff at Seabrook Exclusives. One night my daughter and I blew a bathroom breaker with two hair dryers going at the same time. I called the next morning to ask a question on an unrelated matter and mentioned it in passing. Someone was there that same morning to fix it! Very quick response time. Would definitely rent from them again! What a beautiful rental! We really enjoyed our stay! Unit was very well stocked, clean and well cared for. Photos on the web site accurately show the unit. 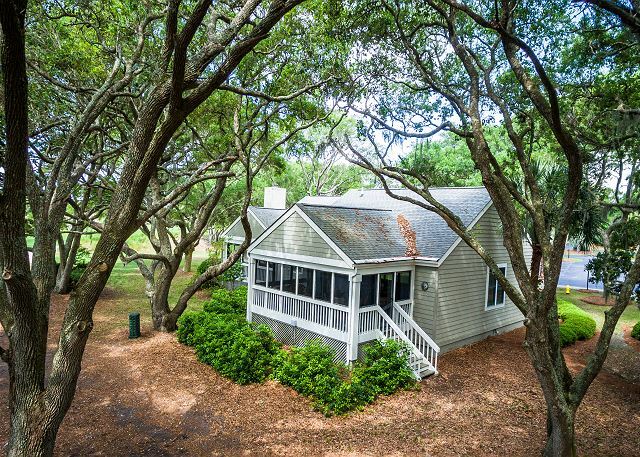 We stayed two weeks in spring 2017 and were very pleased with the property and Seabrook Island. Very very quiet. Walking distance to beach was a bit more than we expected. We rented bikes and solved that problem. Bring a bike if that's an option. Would definitely return and recommend to others. Location and amenities were perfect! Beautifully renovated and lovely cottage. Screened in porch was a huge plus! Nicely updated and maintained; clean; beautiful view from the screened porch with lots of critters to watch. Despite two days of rain the time away from work was great. Thanks! Super place. Beautiful 2 bdrm duplex. Dissapointing that you receive amenity cards to use the amenities but have to pay to use the amenities. Regardless we did not use the amenities but choose to enjoy nature, with walks to the beach. The neighborhood is very safe at all hours of the day and night. 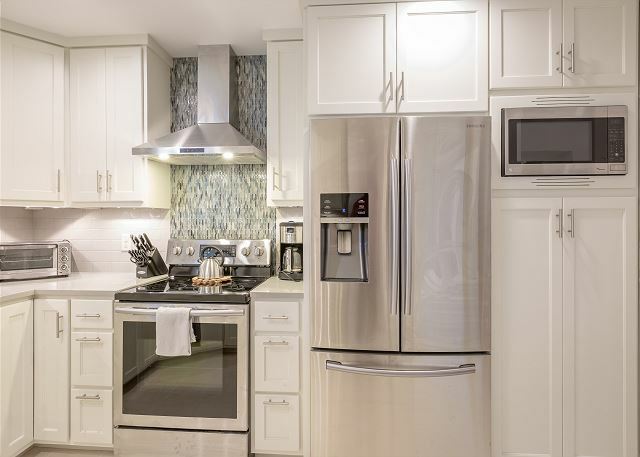 Also the appliances are all upgraded with plenty of dishes and flatware. This is usually my pet peeve. I would highly recommend this place. Seabrook is a little slice of paradise! We enjoyed every minute of our stay. Quiet nights, fun days, and an amazing location on the island. Will stay here again for sure. Our rental was easy, fast, well-supported by Seabrook Exclusives, and most enjoyable. The villa was spotless, well-appointed, and just a relaxing and enjoyable place. We loved the newly renovated home and the location. We've staying in many places at Seabrook over the years and this is now a favorite. It is beautifully decorated and the owner's have made sure it is a special experience staying there- very well appointed. 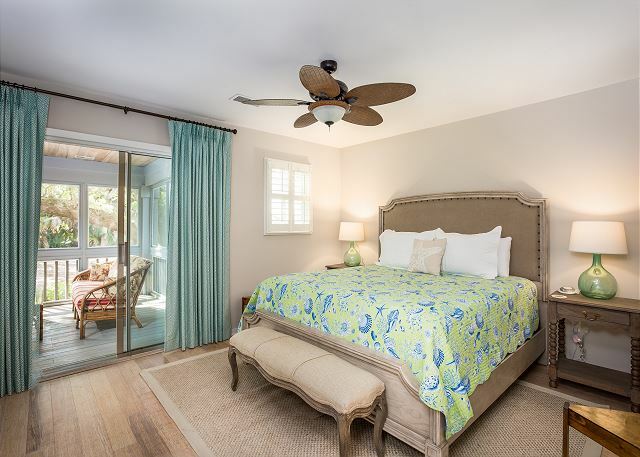 The location is private but very convenient to the beach house pool and the beach. This house is awesome! I would argue that it is the nicest 2 bedroom cottage/house on the island. Totally updated and super clean! In addition, the house is equipped with every utensil and small appliance you would ever need. I highly recommend! 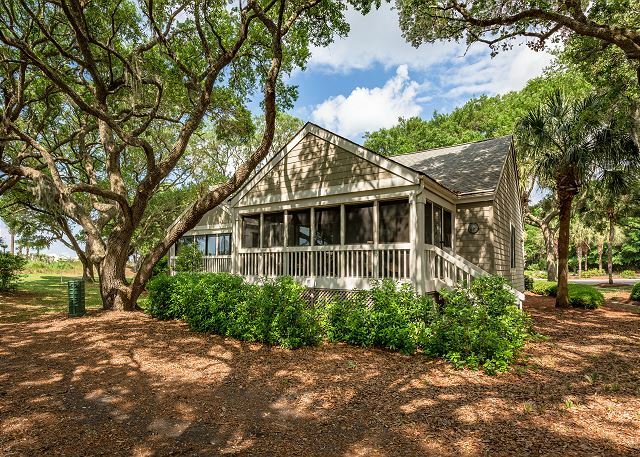 Such a perfect cottage for a beach trip! We spent a week at Seabrook with our 1 year old. We LOVED this rental unit. Every square inch was completely updated and beautifully decorated! A peaceful part of the island with an easy bike ride to the Beach Club. I would definitely recommend this unit to anyone looking for 2 bedrooms accommodations! My husband and I rented this cottage for a week, and the space was immaculate. 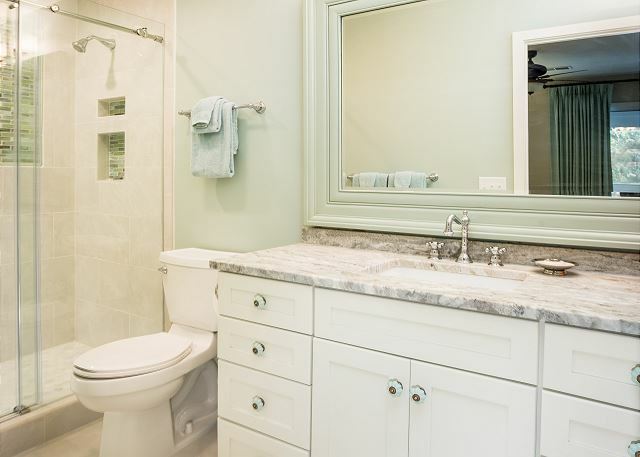 We spend a lot of time in hotels and renovating houses, and this unit was recently updated with impeccable taste. We can't wait to rent it again! We enjoyed our week at Seabrook. The villa was clean, comfortable and quiet. It's wasn't far from beach and pool so we rode our bikes everyday. Our 7 year old grandson had a blast. 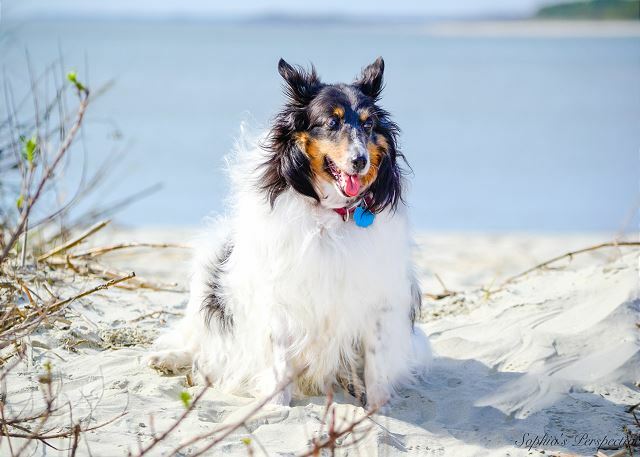 We like Seabrook because people are friendly, family oriented and dog friendly! This was our 5th visit and will continue to come back.